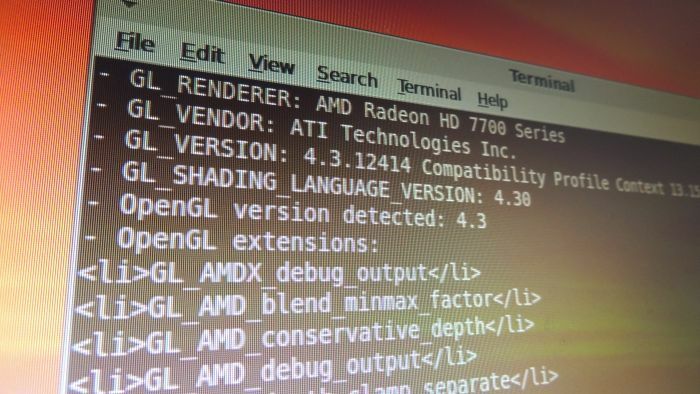 Here are the OpenGL extensions exposed by AMD Catalyst v13.15.100.1 for a Radeon HD 7770 under Linux Mint 15. I used GLSL Hacker with the /glinfo command line parameter to generate the list of extensions. You can download the driver here: amd-catalyst-13.15.100.1-linux-x86.x86_64.zip @ AMD. Compared to the latest Catalyst 13.4 for Linux, this new Catalyst exposes 243 OpenGL extensions (and 22 GLX extensions) and adds one new GLX extension and 9 new OpenGL extensions. – GL_VENDOR: ATI Technologies Inc.